Whether it’s for my skin, hair or just general health – I love a supplement. 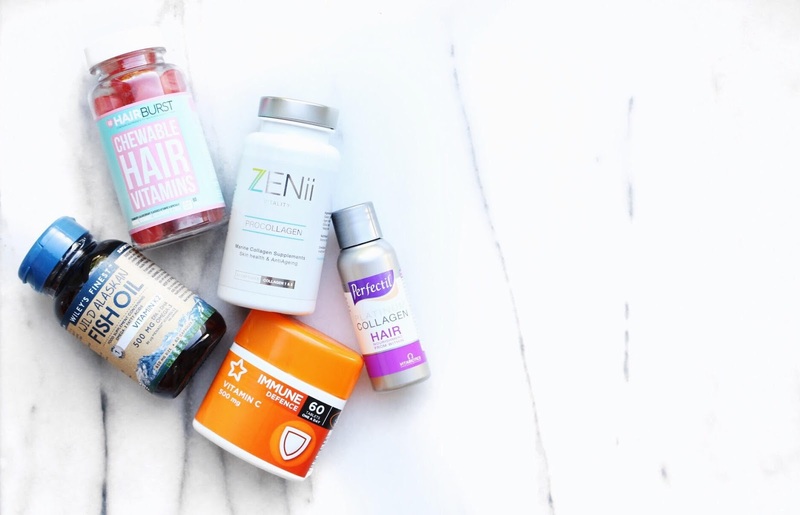 For someone like me who struggles to naturally grow Rapunzel hair, is always wary of spots trying to invade my skin and generally wants to take care of my body, supplements are great for helping me regulate my health and beauty. Please note: I do not take all of these at once. These are recommendations of my favourite supplements. It's important not to exceed recommended daily limits for supplements and vitamins so always check labels and calculate your intakes. Whilst I would typically choose a pill over this ever-so-strange orange drink, there's no denying that this blend of nourishing hair vitamins does works wonders. Including marine collagen, biotin, selenium and zinc, this beauty drinks supports the strength and natural growth of your hair whilst also boosting your skin and nails. Amaze. The one thing I'm not crazy about? The almost £40 price tag for 10 days worth of product. Omega 3 is a wonder substance and Wiley's Fish Oil doesn't just contain heaps of Omega 3, it also includes Vitamin K2 and Vitamin D. These ingredients are great for your heart, blood, bones - you know- all the important stuff. It's easy to remember to take supplements that benefit the outside of our body, but it's also important to go the extra mile to take care of what's inside too. This may be an incorrect connection but I've also noticed a difference in my skin since religiously taking Omega 3 supplements. It's less prone to hormonal breakouts and is more radiant and healthy looking in general. We've all seen products like these plastered all over Instagram, but the question is - do they actually work? In a short answer yes. BUT (the dreaded but) if you did buy all the ingredients as separate supplements, you'd save yourself a hell of a lot of money. For the days which I fancy a treat and opt for something like Hair Burst, I never regret it. They do encourage hair growth and I do see results, plus they taste amazing! Hair Burst alongside Sugar Bear Hair are my faves. Collagen is the thing that gives our skin tissues strength and density. When taken in a decent supplement, your skin becomes more radiant and elasticity improves which can prevent lines and soften wrinkles. Yup, give me all the collagen. This Zenni product contains a high dosage of Marine Collagen which is like the caviar of collagen. Although this isn't advertised a multi beneficial product, marine collagen is also amazing for your hair. Whilst the above are a concoction of various vitamins, when I don't fancy forking out for a new batch I take it back to basics and take these single vitamins together for a DIY super supplement cocktail. Folic acid is recommended as a pre-natal vitamin but I am obsessed with it. Not only does it help your body produce and maintain healthy cells (hello, radiant skin), it also reduces the risk of high blood pressure and Anaemia. Love it. The worst kept secret to healthy and faster hair growth. This is the predominant ingredient in every hair growth vitamin you can find. It is the key. Best of all it's super inexpensive so you can make a DIY hair growth formula without splashing the cash. Who doesn't hate being unwell? I certainly do. Vitamin C helps boost your immune system and maintains your overall health. It's also said that Vitamin C is vital for the normal functioning of your brain and can regulate your mood.